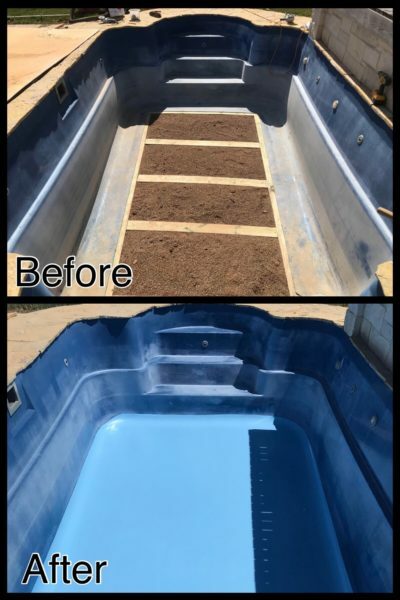 How It Works – Pool Remodeling Process at Texas Fiberglass Pools Inc. Here Is What You Can Expect When You Call Texas Fiberglass Pools Inc. When you need pool, deck, fountain or patio work, at Texas Fiberglass Pools Inc. we understand it’s a huge undertaking requiring a lot of research, time and money on your part. Whether you’re a homeowner with an older pool or a business owner managing commercial pools, when you call Texas Fiberglass Pools Inc., your concerns are our number one priority. From pool leak detection to total remodeling, when you call us for information concerning your pool, deck, patio or baptistery, you will be greeted by a customer service professional with expertise in the fiberglass pool industry. We will review your concerns, worries and desires. We’ll take a detailed account of what problems you’re having, what you want your final outcome to be and what budget you have. We will set up an appointment at your convenience for a no-cost, no-obligation evaluation. One of our project managers will meet with you, assess the situation, discuss options and provide an estimate. We’ll email your estimate and our office will go over details. You have unlimited time to check the estimate and review other options.We are always available for any questions. The Process At Texas Fiberglass Pools Inc. When you decide to work with us, you will meet with the same project manager from your first appointment to sign a contract and from there, set a start date. He will then come by with a crew to review what the project will consist of and go over what will be done each day. You can always rest assured we are always a phone call away if you need anything or have any questions. Your project manager or the owner of Texas Fiberglass Pools Inc. will stop by during the course of the project to ensure everything is running smoothly.Part of our process is checking in with our clients and making sure they are happy with the progress and how the project is looking. At the end of the project we will schedule an appointment for a final walk through and review our chemical sheet for pool balance recommendations. This paper work ensures you know what the recommended chemical levels should be. This walk-through also ensures you are satisfied with the end results. It matters to us that you are completely satisfied with the job we did for you. The final steps when you work with Texas Fiberglass Pools Inc. When your job is done and we leave knowing you’re happy, we will follow up a week later to do a short survey about your overall experience with Texas Fiberglass Pools Inc.. We’ll even ask you how we might improve going forward. We’ll follow up again in one month to check up and ask how you are enjoying your pool. We’re not happy if you’re not. Your complete satisfaction is our number one priority.